So last Halloween my 17-year-old black cat, Luna, died. I went to San Jose, where she was living, to take care of her before deciding she had to be put to sleep. 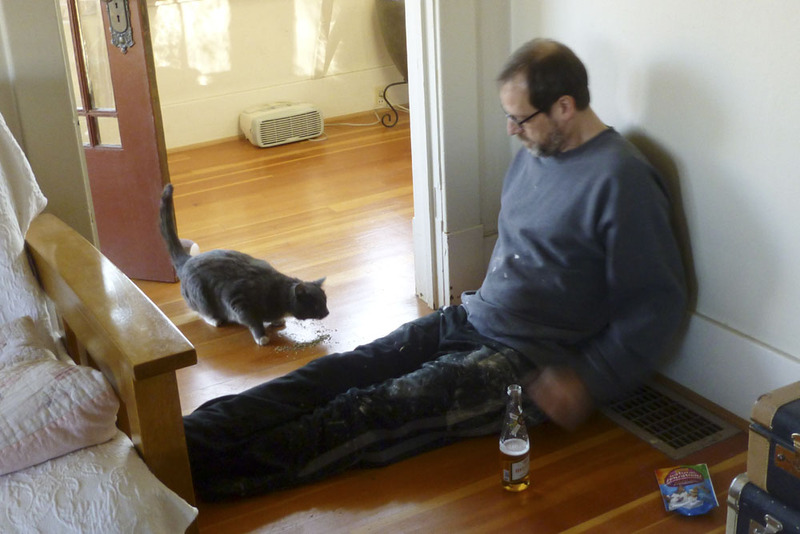 While I was gone, Mike noticed a cat (or two?) hanging around under our porch at night. It was starting to get cold, and the cat was always around when he’d come home from work at 11 pm, so of course, he started feeding it. It was hard to see because if it saw us it ran away in a flash. Eventually we set a trap to catch it because we wanted to know its status (pregnant? stray? feral?). We went to the Humane Society and borrowed a trap and easily caught it. As it turns out, it was a neutered feral, so we let it go. Around the same time, we noticed another cat (or were there two all along?). This one was smaller and grey, but would also hang around the porch at night, wanting to be fed. Now it was around Christmas and really cold so we made a bed on the porch with a box and a heating pad and continued to put food out. We still weren’t totally sure how many cats there were or what was going on. 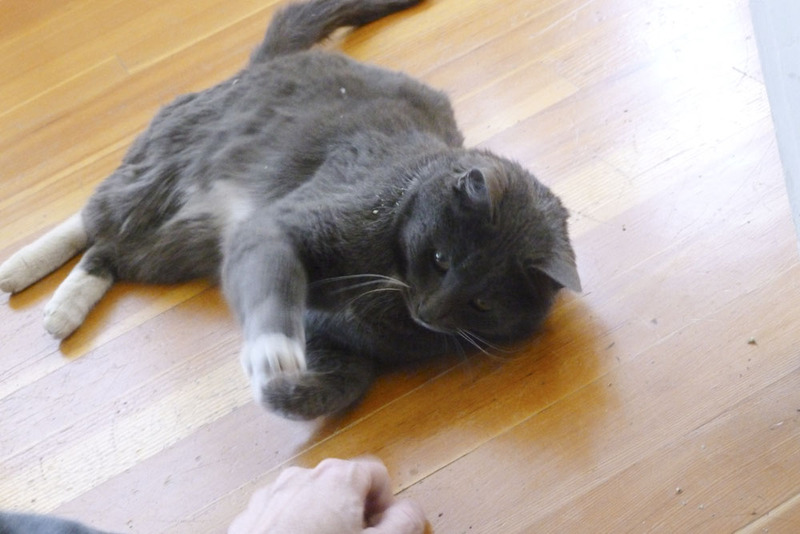 Eventually the little grey one became slightly more friendly. One day in February we saw him lounging on the porch out in the open. 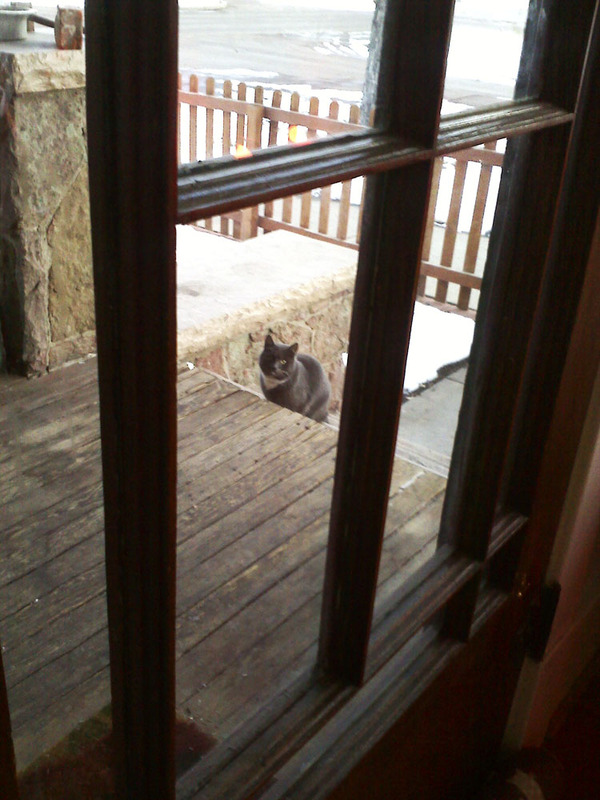 The first real sighting of the porch cat. But when we’d go out there he would run away really fast! He was still super skittish. 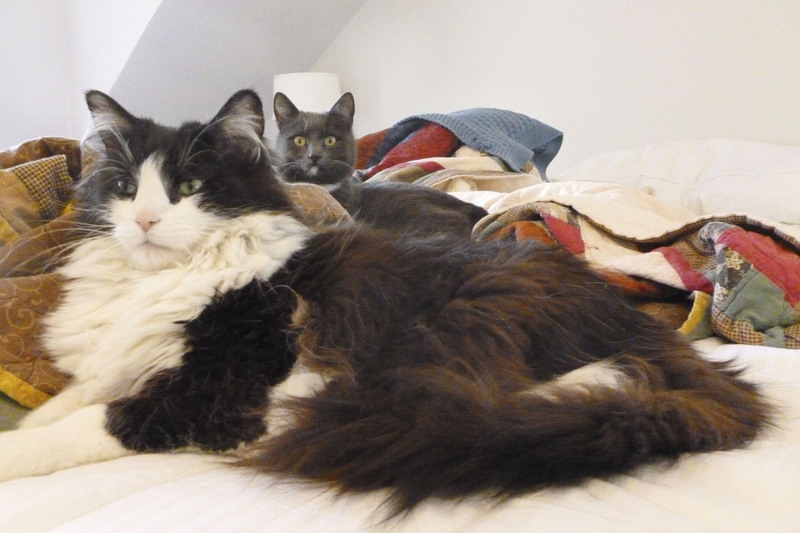 By now we noticed there were actually three cats. The original feral we caught and released, another scary-looking feral, and this cat, who didn’t seem feral, but also didn’t really seem tame. We started calling them names of characters from the TV show “Breaking Bad,” which we are kind-of obsessed with. The original cat was Jesse, the new mean-looking one was Tuco, and this one was Gustavo Fring. Eventually he stopped running away when he saw us through the window, but still scurried off if we went outside. Porch cat in his makeshift porch bed. Every now and then we could open the door a little and he’d stay put. 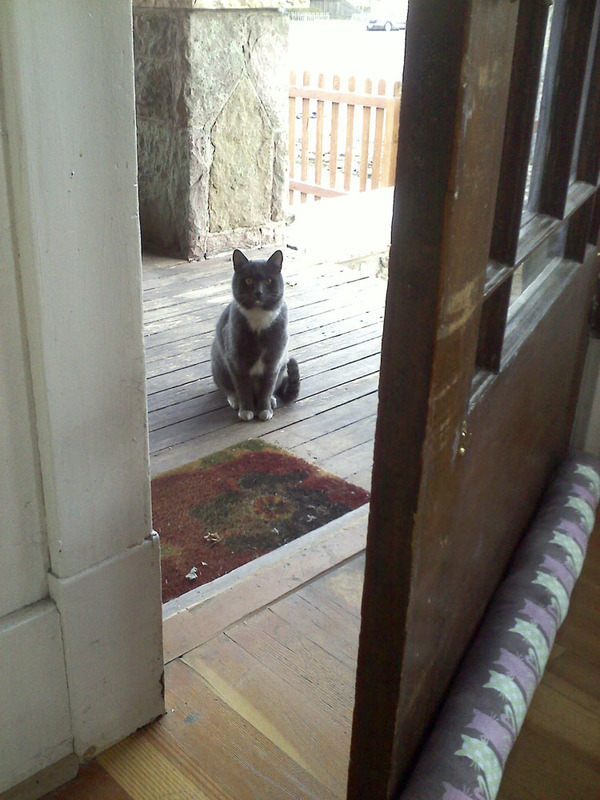 Porch cat is not sure. 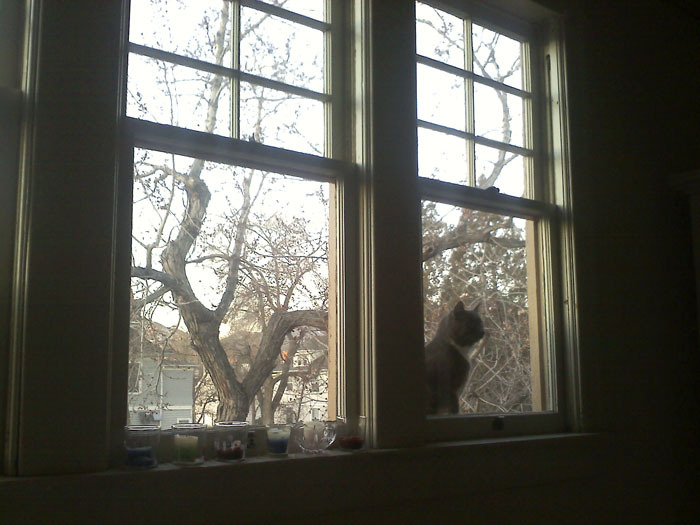 One day he climbed up and looked in the window. Cookie Puss was there and it was love at first sight. It was like the angels were singing and hearts and flowers were going up in the air. 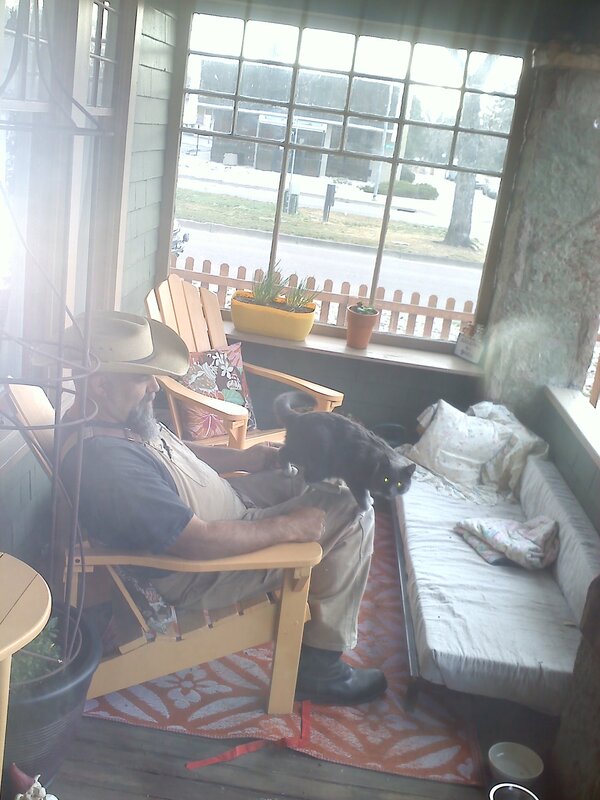 Porch cat and Cookie Puss, love at first sight. After that, porch cat decided it was probably OK to come in the house from time to time, especially if there was catnip available. This cat likes to play. Probably not a feral. So, he was friendlier now. But we were so busy with the job search, the house fix-up, the plans to move, etc. 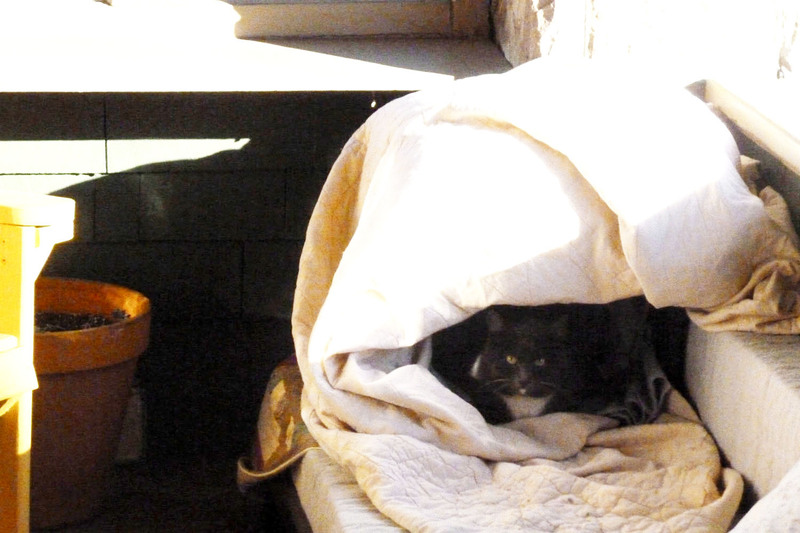 Plus we still had PJ, who was not a fan of porch cat. So he hung around all winter, using the bed and eating whatever food we gave him and coming inside every now and then for a few minutes at a time. In early March, PJ died. The day after he died, porch cat somehow climbed up on the back-side of the roof, walked up and over the top of the roof and around to the front and appeared in the bedroom window. How he knew it was our bedroom is a bit of a mystery. I woke up at like 6 a.m. to meowing, which was really disorienting because PJ used to always wake me up at 6 a.m. meowing. I looked up and saw this. It was really, really strange because he’d never done that before and he seemed suddenly super interested in coming inside. But we didn’t let him because we had no idea what we were going to be doing over the next few months, where we were going to live, etc. We didn’t want two cats and we didn’t want to be responsible for another cat who may or may not have any medical problems. Still, we fed him and generally looked out for him, while trying to figure out if he was a stray, had people, or what. In Mid-March my brother and my mom came out to help us with some final house projects. It was oddly warm that week so we hung out on the porch all the time, in the morning, during the day and into the evening. Porch cat was really friendly now, hanging with us when we were outside! But he went back to not being interested in coming in the house, which was fine because we weren’t sure we wanted him to. 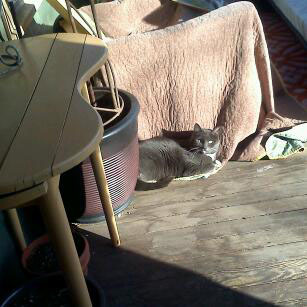 One day in late March I opened the door to the newly renovated dressing room and saw porch cat sleeping on the chair. I had accidentally left the window open and I guess he climbed up onto the roof and went inside. It was cold and sort of snowy again so I let him stay, keeping the window open so he could come and go, but not letting him go into the rest of the house. Every time I looked in there, he was still there. Eventually I put his food and water in there and added a litter box. The next day he was still there. The food had been eaten but the box hadn’t been used. I thought that was strange, but eventually figured out that he had been coming and going thru the window and up and down the roof to do his business. Poor kitty didn’t understand the litter box. Apparently this cat wanted to live with us. We had been feeding him and he had been sleeping on our porch every night for like four or five months. We were pretty sure he didn’t have people. But where did he come from? Maybe someone from the big apartment building left him behind. There’s a lot of turnover there and people don’t always take their pets with them when they move. Or maybe he was a reincarnated ghost. We took him to the vet and he was in good health. The vet said he was probably about three years old and already neutered (no chip). We think he’s probably a little younger, though, because he is far too playful for the elderly age of three. Anyway, we got him some shots and wondered what we’d do with him. Before the vet trip we had tried to find him a home with neighbors. No one really wanted to take him so we thought we might keep him if he got along with Cookie Puss. 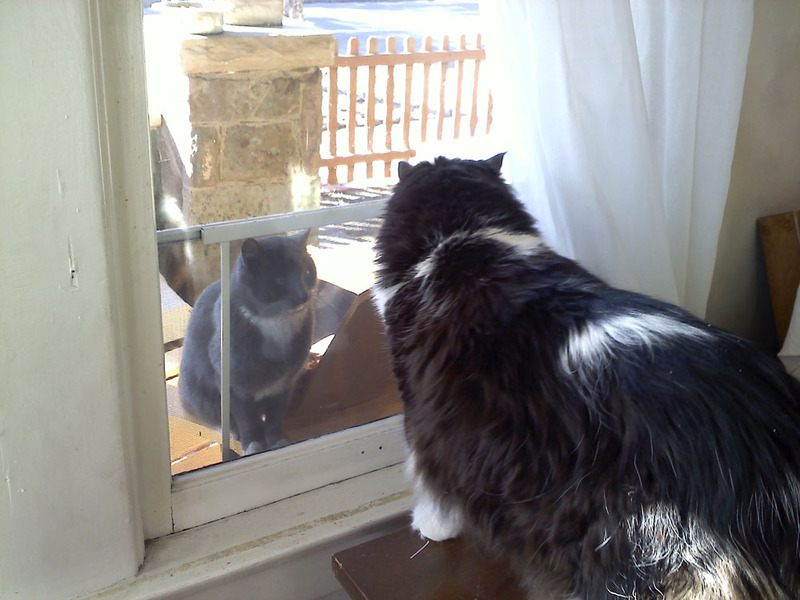 Aside from that first time in the window, they hadn’t had much contact. We intended to introduce them slowly, but I guess they had other ideas. When we got back from the vet Cookie Puss was on the bed. Gus jumped up there, and the rest is history. They are best buddies, it’s crazy! Gus and Cookie Puss, together at last. So now Gus is no longer called Porch Cat, and he’s been with us through all our adventures: Road-tripping to L.A. and Yellowstone and back. And he’s getting used to Chicago life in a small apartment. Sure he doesn’t get to roam the way he used to, but he’s warm and well-fed, and he seems pretty happy. Welcome to the family, Gus.